PYCAB? What is PYCAB? This question might not be asked as much in the near future. The technology platform founded by Beatrix Förster was just elected as one of six start ups worth funding by the women’s forum of HypoVereinsbank. The young human biologist has met her official mentor, DLD co-founder Steffi Czerny, before: Förster already introduced one of her cutting-edge ideas at the DLDwomen conference in 2011. Supporting innovative ideas by women is normally not the first thing that comes to mind when thinking about HypoVereinsbank. But that is exactly what the mentoring programme of the HVB women’s forum is all about. For the second time, six promising ideas for start ups in the scientific and the tech field were awarded. Each of the winners is assigned a mentor that will help them with practical entrepreneurial tips, background business knowledge, and their extensive working life experience. Steffi Czerny happily fulfills this role, as she emphasizes her admiration for of young entrepreneurs, “their determination, their energy, and their will to put an idea into action”. In the six months to come, the young female entrepreneurs will be counseled by their mentor as well as one of the bank’s venture founding specialists. Furthermore, they have the chance of participating in several exclusive events – like DLDwomen in July 2013 – that will enable them to connect with like-minded people and further successful entrepreneurs. Taking a closer look at Czerny’s mentee, it becomes clear that she might be a newcomer to the entrepreneurial world, but definitely not to the scientific one: Förster has various experiences in a number of medical research fields and collected these internationally: After her studies of human biology in Marburg, Germany, and Melbourne, Australia, she did her PhD at the Max-Planck Institute of Biochemistry. Her scientific discoveries even resulted in a patent. In Martinsried near Munich she contributed to the founding of the biotechnology company “Suppremol”, where she developed remedies for autoimmune diseases. Then, she moved to Stanford University to do research in a renowned laboratory for allergy research. 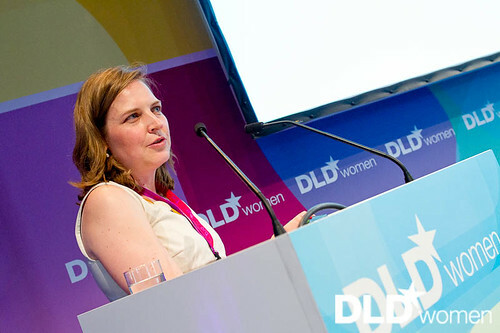 When Förster spoke at DLDwomen two years ago, she promoted personalized medicine, which she sees as the method of treatment for the future, especially for women. The reason for a need for improvement of gendered treatment is that the “usual drug” is orientated towards a 35-year-old 70 kilogram male. The scientist introduced an innovative collaboration in the Munich area to promote this idea: It’s called “M to the 4”, because it involves partners from four fields, including a pharmaceutical and the biotechnical one. The scientist’s current project “PYCAB” poses a real alternative to common antibiotics and attains medical progress through innovative research. Multiresistant germs in hospitals are dangerous for both patients and personnel. Until now, such bacteria have been treated with a combination of antibiotics, which often provoke the germs’ resistance. PYCAB develops new antibody medication, which doesn’t lead to the development of this resistance. Furthermore, such remedies possess a special effectiveness against germs that exist in local hospitals and nursing homes. Förster’s selection as a pioneering innovative scientist-entrepreneur by the HVB women’s forum substantiates DLD’s instinct for introducing new important faces to the world. Giving them the opportunity to convey their message to a broad audience is the first step of promoting an advance not only for their personal, but also for everyone’s future.